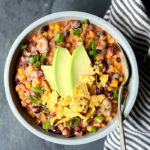 Creamy Chicken Taco Chili made in the slow cooker! Serve like soup or over chips as nachos. 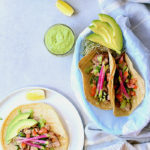 With so many savvy blogs and talented food bloggers out there it is not difficult to find great recipes. Where do you find most of your favorite ones? If I want to make something with, say…cauliflower – I search Pinterest for a new recipe or to see what flavors combine well together in order to come up with something new. This time I lucked out of the search and this beautiful Crockpot Chicken Taco Chili recipe was sent to me by my mom. She got it from one of her friends so I am not sure where it originated but I love how simple crockpot meals are! I made this using ingredients I had on hand. Instead of using a can of diced tomatoes with green chili’s, I used 1 can of diced tomatoes and 1 small can of diced green chilies. For the cream cheese I had artichoke jalapeno flavored from Costco in the fridge so I just used that instead of plain. 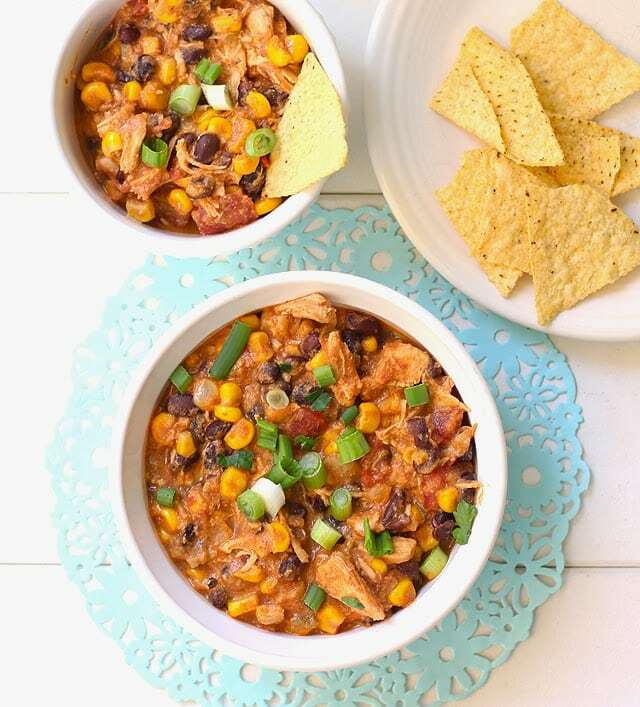 I know you will love this Crockpot Chicken Taco Chili recipe! If you are vegetarian, substitute the chicken for tofu. I like to eat it as chili with a side of tortilla chips and the boys turned theirs into chili nachos. What are some of your favorite recipes from your mom, sister, grandmother or friends? Thanks Mom for this one! Place frozen chicken in the bottom of crockpot. Top chicken with corn, diced tomatoes and green chili, rinsed black beans, cream cheese and taco mix. 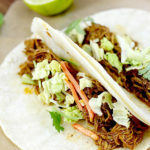 Cook in crockpot 4-6 hours (depending on your crockpot) on HIGH. Stir occasionally. When done, remove chicken and shred with 2 forks. Return chicken to chili and serve with any optional toppings.